It seems to be all the rage these days at your favorite smoothie and juice haunts, but is celery in a glass really the green goddess many think it is? Let’s take a sneak peek at this humble veggie to find out. We often think of celery as a great veggie to pair with other things. For instance, celery and peanut butter, a favorite quick and healthy snack. You might also slice and dice celery to use in chicken salad, soups, or stews. But can celery really stand alone as a star? The simple answer is, yes, it can. Here are five reasons why celery juice is growing exponentially in popularity among health enthusiasts. Here is something kind of strange, celery actually looks a little like human bones. Do you think that it is a coincidence that bones and celery both contain 23%? Probably not. Amazingly, celery’s high calcium content can help not only regenerate but also strengthen bones that are damaged. Celery also contains vitamin K, which is important for bone metabolism and protects against osteoporosis. When food containing calcium is cooked, the calcium changes into inorganic atoms and cannot be used by the body for regeneration. When the body lacks sufficient sodium, the body pulls what it needs from the bones which leaves them very weak and fragile. A glass of celery juice can help to keep your skeletal system strong. The healthy nutrients and fiber in celery come to life when the veggie is juiced. These nutrients promote a healthy digestive tract, acting as a natural laxative and relaxing nerves that have been compromised by a poor lifestyle. Celery juice has a powerful cooling impact on the digestive tract which makes it an impressive anti-inflammatory. This is great for people with digestive issues like IBS or Chrons. The natural sodium in celery juice also helps with nutrient absorption, while the enzymes raise hydrochloric acid in the stomach so that food can be easily digested and does not ferment. Many people swear that drinking celery juice each morning on an empty stomach can ease digestive woes, alkalize the gut, and transform health in just a week. Celery contains coumarins which are compounds that promote white blood cell activity and a healthy vascular system. This includes better blood flow, reduced blood pressure, and blood purification. Conditions of the blood and nervous system are often caused by inorganic elements and salts that are taken into the body via dead and processed foods. The sodium in celery maintains blood fluidity and lymph and keeps them from becoming too thick. Vitamins A, C, iron, and magnesium in celery nourish and rebuild red blood cells which can help people who have rheumatism, high blood pressure, arthritis, and anemia. The two properties that celery contains, polyacetylene and luteolin, make celery an inflammation busting superstar. Luteolin is a potent bioflavonoid that can inhibit the impact of certain enzymes which are responsible for an inflammatory response. A study published in the Journal of Nutrition showed that brain cells exposed to luteolin showed a significant decline in inflammation. Luteolin is also a powerful antioxidant that helps combat free radical damage and decreases oxidative DNA damage due to inflammation. Polyacetylene lowers inflammation throughout the tissues in the body. 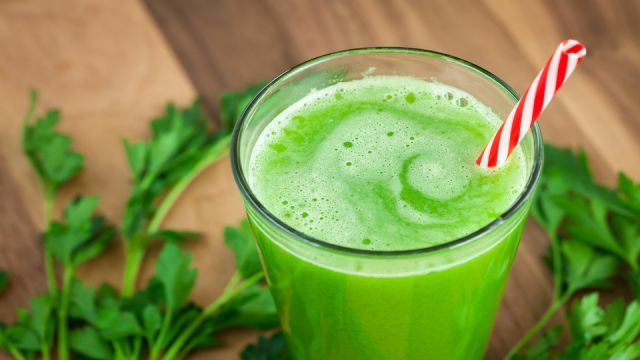 What all this means, is that drinking celery juice can reduce symptoms caused by arthritis osteoarthritis, cancer, heart disease, gout, multiple sclerosis, Alzheimer’s and more. As mentioned, celery juice is not only hydrating but also alkalinizing. This makes it highly effective for keeping the body’s pH balanced and neutralizing acidity. This protects healthy cells and balances levels of essential minerals, which in turn lowers the risk of heart disease, protects bone density, reduces inflammation, boosts the immune system and can help you maintain a healthy weight. Tip: Always buy organic celery to juice at home and be sure that any celery juice you do drink is organic. Celery is high on the list for being one of the most pesticide-laden crops ever. The next time your friends head out for a celery juice… join them and drink up!! Next articleCould The Ten Year Facebook Now and Then Challenge Be a Trap?